By popular demand, my mom agreed to make her vegetarian stuffed cabbage rolls! I promise, these are easier to prepare than they look. This is one of my favorite childhood meals. I lingered in the kitchen so I could watch how mom made the stuffed cabbage rolls. She chose to go for a vegan version where the stuffing is simply made of rice, chunks of tomato, onions, fresh herbs and spices. The cabbage is first boiled whole, the top layers are peeled away as they blanch. Here is more on boiling cabbage leaves for stuffing. It is easy, and it works! 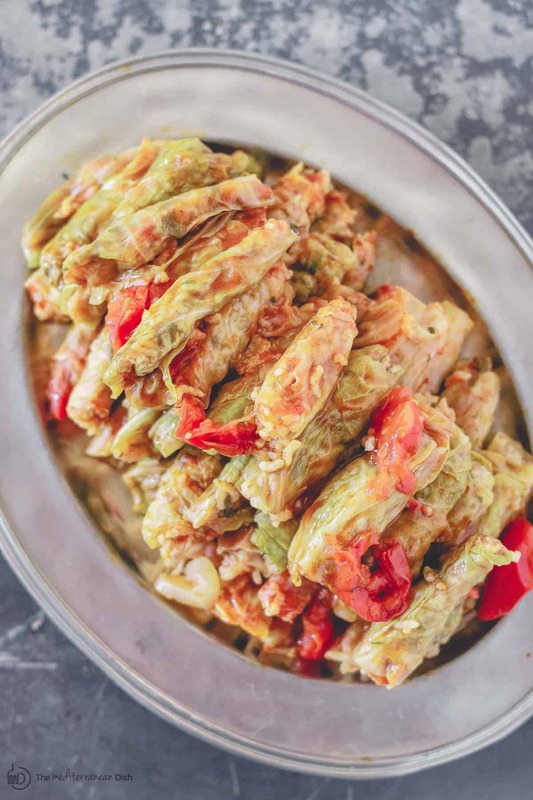 Because mom prefers the cabbage rolls to be elegantly small (bite size), she cut the cooked cabbage leaves in thirds and proceeded to fill them with a little of the rice stuffing mixture. 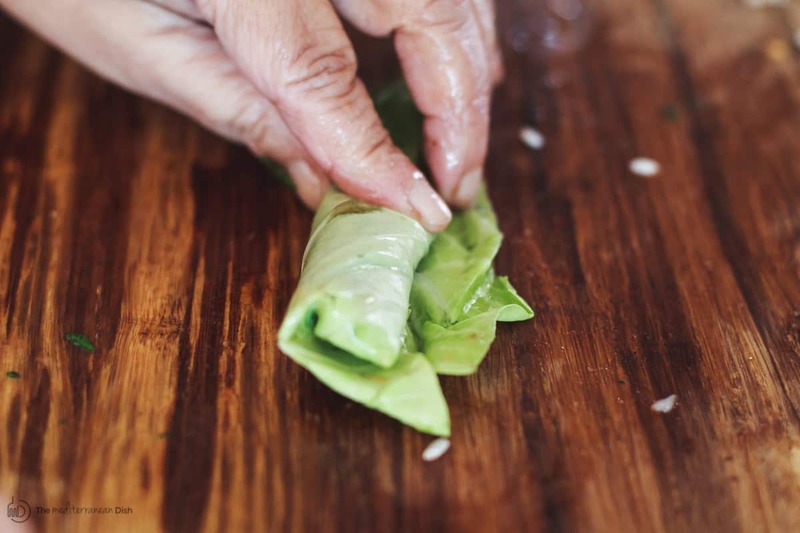 Her trick is to roll the cabbage leaves tightly all the way to fully enclose the rice. She also places a small plate directly on top of the cabbage rolls in the cooking pot. This actually keeps the cabbage rolls from becoming too loose or getting undone as the rice expands in the cooking process. We took some pictures to help you follow along. This is one of my favorite childhood meals. 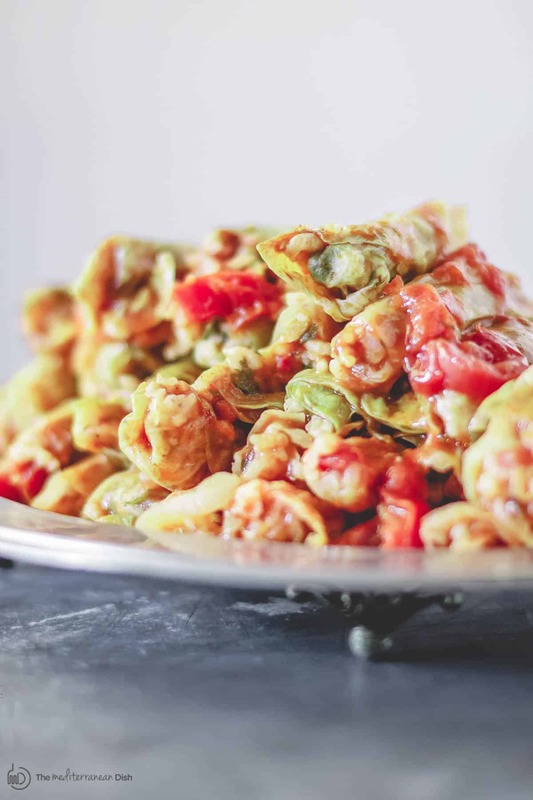 When I serve these vegetarian cabbage rolls, I add sides like tabouli or fattoush salad and a plate of homemade hummus with pita. Remove and discard the first couple leaves of cabbage. Core the cabbage and wash in cold water. Place the cabbage in a large pot of boiling water. As the top layer of cabbage leaves blanches, remove carefully by hand or using tongs. Continue the same process; peeling off the top layer of cabbage leaves as they soften. Set aside to cool briefly. Once cooled, cut each cabbage leaf into halves or thirds, removing any thick veins. Now prepare the rice stuffing mixture. 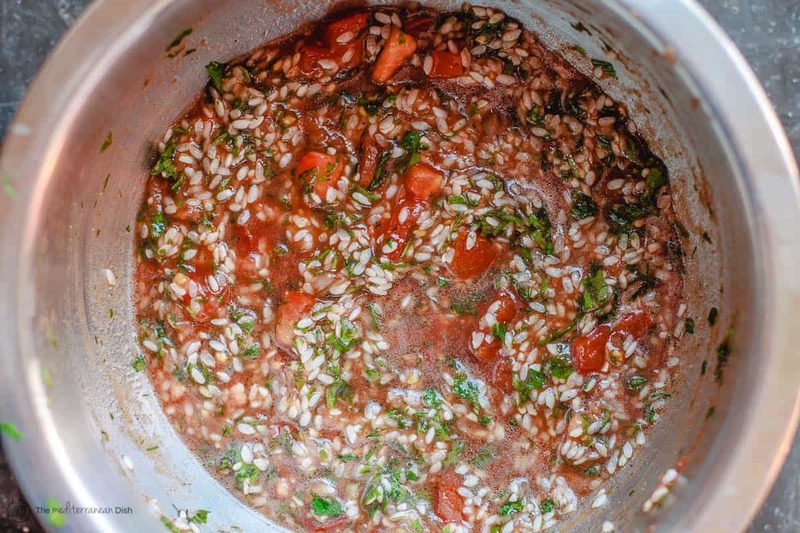 In a large mixing bowl, combine the rice, shredded onions, herbs, spices, oil, 1/2 can of tomato sauce and 1/4 cup water. Mix together with a spoon. Lightly oil a large Dutch oven or heavy cooking pot. Line the bottom with a few cabbage leaves, sliced onions and Roma tomatoes. Now begin to roll the cabbage leaves. Take a piece of cabbage and place on a flat surface, coarse side up. Add about 1 tsp of the rice stuffing mixture on the end of the leaf closest to you. Roll up the leaf to completely enclose the stuffing. Repeat with the remaining cabbage. Layer the cabbage rolls, seam-side down, in the prepared Dutch oven/pot. 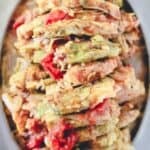 Top with the remaining 1/2 can of tomato sauce, and about 1 1/2 to 1 3/4 cups of water (water should barley reach the top layer of cabbage rolls). Add the ground cumin. Top the cabbage rolls with a small plate. Cook on high heat for 5-7 minutes until the liquid reduces to half. Reduce the heat to low. 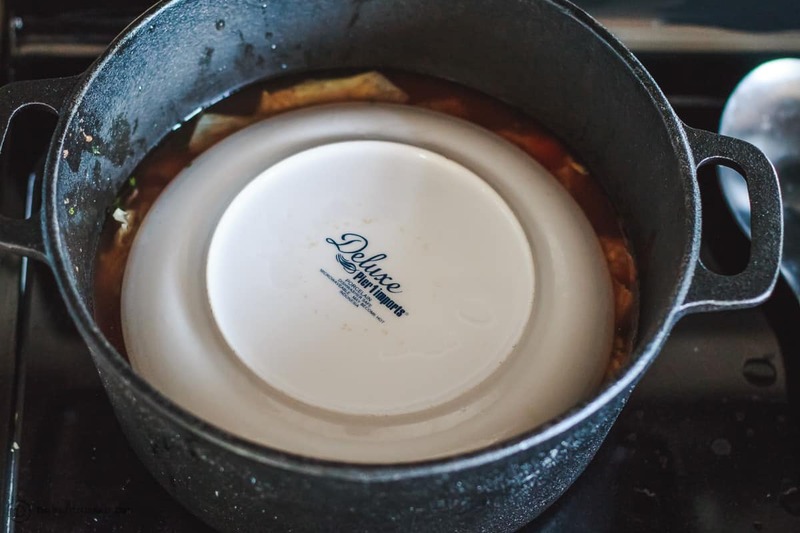 Leaving the small plate in, cover the pot with its own lid. Let cook for 30 minutes then remove the plate. Cover with the lid only; cook for another 15 minutes or until the liquid has been absorbed completely and the rice stuffing mixture is cooked through. Transfer carefully to a serving platter. Enjoy warm. Place the cabbage in a large pot of boiling water. As the top layer of cabbage leaves blanches, remove carefully by hand or using tongs. 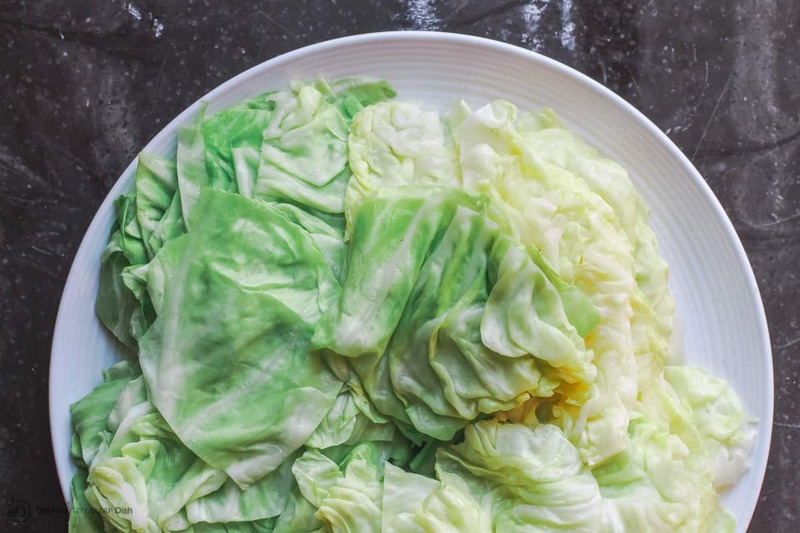 Continue the same process; peeling off the top layer of cabbage leaves as they soften. Set aside to cool briefly. Once cooled, cut each cabbage leaf into halves or thirds, removing any thick veins. Now prepare the rice stuffing mixture. 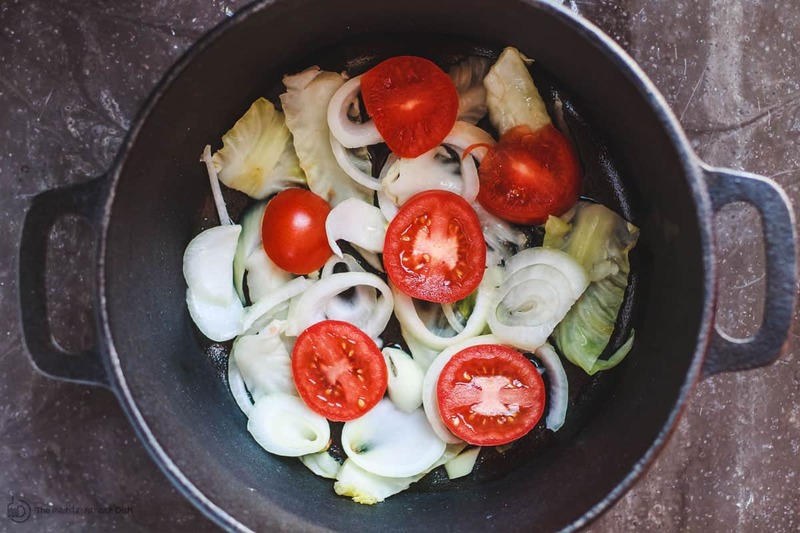 In a large mixing bowl, combine the rice, shredded onions, chopped tomato, herbs, salt and pepper, spices, oil, 1/2 can of tomato sauce and 1/4 cup water. Mix together with a spoon. Lightly oil a large Dutch oven or heavy cooking pot. Line the bottom with the sliced onions and Roma tomatoes. Take a piece of cabbage and place on a flat surface, coarse side up. Add 1 tsp (more if leaves are larger) of the rice stuffing mixture at the end of the leaf closest to you (see photo). Roll up the leaf to completely enclose the stuffing. Repeat with the remaining cabbage. Layer the cabbage rolls, seam-side down, in the prepared Dutch oven/pot. Top with the remaining 1/2 can of tomato sauce, and about 1 1/2 to 1 3/4 cups of water (water should barely reach the top layer of cabbage rolls). Add the ground cumin. Top the cabbage rolls with a small plate. Cook on high heat for 5-7 minutes until the liquid reduces to half. Reduce the heat to low. Leaving the small plate in, cover the pot with its own lid. Let cook for 30 minutes then remove the plate. Cover with the lid only; cook for another 15 minutes or until the liquid has been completely absorbed and the rice stuffing mixture is cooked through. Transfer carefully to a serving platter. Enjoy! 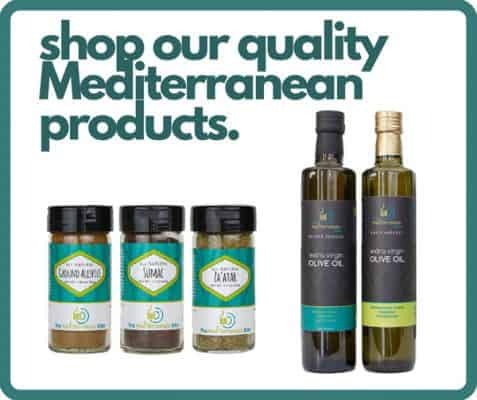 Try our Private Reserve Greek extra virgin olive oil (from organically grown and processed Koroneiki olives)! 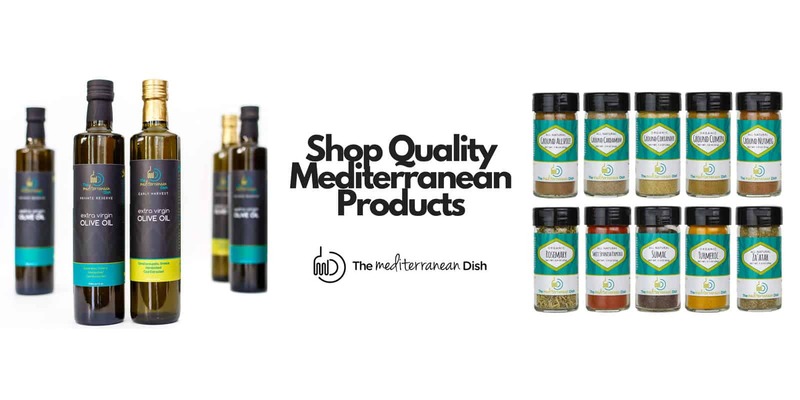 Don’t miss our Ultimate Mediterranean Spice Bundle (quality all-natural and organic spices). Visit our SHOP! I modified quite a bit, but still turned out great! I cooked up some quinoa and added a jar of homemade salsa to it. Then added oil and quarter jar more of salsa to pot. Put rolled cabbage in pot and covered with rest of salsa and water. Didn’t need the extra water (quinoa was already cooked)! Cooked for about 10 minutes. Family loved it! Love to hear these variations! Thanks for sharing, Mary! Hi! Can I use brown rice instead of white rice? How long would cooking time be? 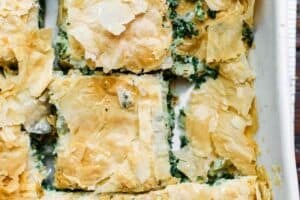 Would love to try this recipe out, but the blanching of the cabbage leaves seems like it would be such a hassle. Could I just chop the end off and blanch them loosely, and take them all out at the same time? What is the reason for using your method? You can try that, Sarah! It might work just fine, but I have always done it the way it’s stated here and found it okay. I am keen to try this recipe but I have to question two items on your ingredients list.? I cant imagine shredded onion in such a small spoonful parcel. Do you mean finely diced onion? Could I use a can of tomato paste rather than tomato sauce? Hi Mary, shredded onions and tomato sauce are best in this recipe. Enjoy! can i freeze these adter cooking? Hi, Lesley. Yes, you can freeze this after cooking. Enjoy! is there no need to pre-cook the rice? Hi Melanie, that’s correct! 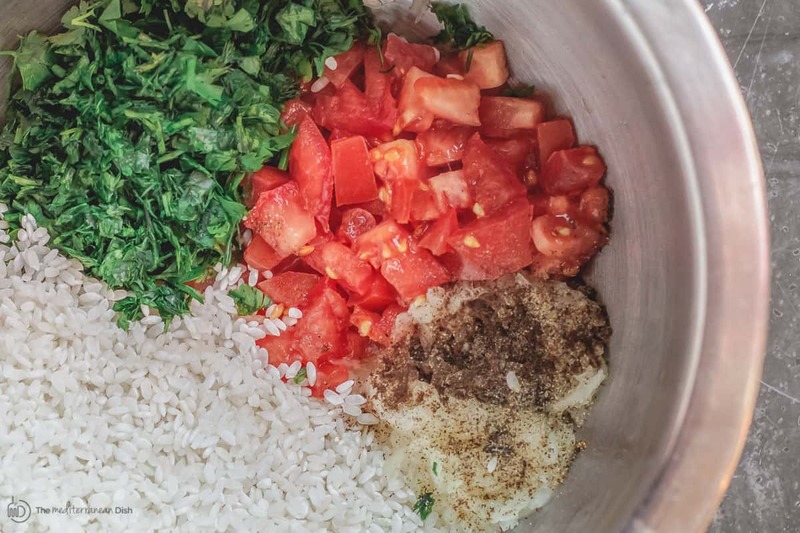 No need to pre-cook the rice. If that’s your preference, then you can use cooked rice, but then adjust the cooking time as needed. I’m cooking these right now but I may have overcooked the cabbage (I got a phone call and forgot about the cabbage) before stuffing them. Will they fall apart? I will let you know how they come out… ugh I’m so upset with myself! Oh Melanie! Sorry to hear. I hope they still work out though. If some fall apart, don’t worry so much. As long as the rice insides is cooked through, they can be messy, but still tasty! Think “deconstructed” Enjoy! These look amazing. Plan to make these for a gathering, however; I would need quite a bit. 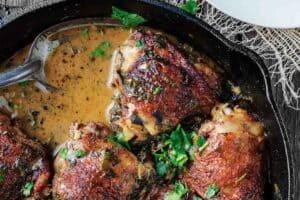 Can these be baked in the oven rather than on the stove top? If so, what temp would you recommend and for how long? Hi Debbie! Oh my goodness, so sorry that I just saw this question. I hope it’s not too late. This is meant to be cooked stove-top, I haven’t honestly tried the oven and not sure it would work. But, you can make it ahead of time and heat it up on medium-low or low heat with just a little more added water if needed. Enjoy! 1. If you use dried dill, how much would you use? 2. 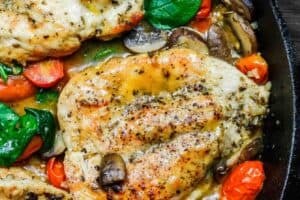 Can you use a different/better type of oil instead of vegetable oil? Hi Katie, I would say about 2 teaspoons of dried dill weed should work well here. 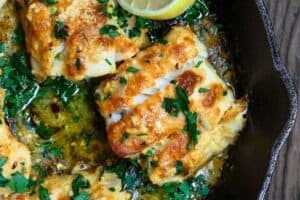 I use either extra virgin olive oil often for this recipe. Enjoy! was just wondering if I can prep the rolls a day before – place them in the pan and then cook them the day after? Hi Lina! Yes, my mom used to do that all the time! Just cover tightly and refrigerate over night. I just made these. They were really good!!! I think I will use cooked rice next time as my rice was a little undercooked. Hi Katie! Glad you liked them. Sometimes, depending on the kind of rice you’re using, you may have to test one and see if it needs a little more time. Adding a little liquid, if it needs, would help. This looks brilliant! Just confirming, do you fold the sides of the cabbage leaf in to ensure the filling is completely enclosed? 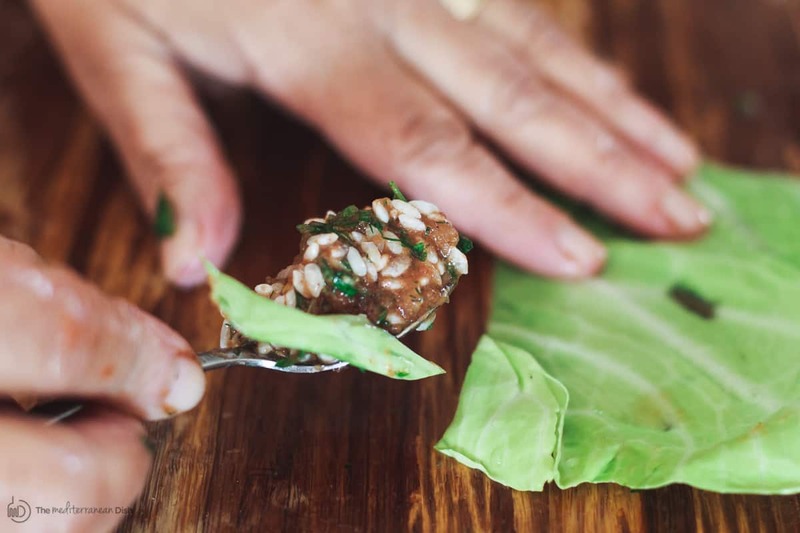 Like you do with the traditional large full leaf polish cabbage roll? Hi Tyler. So sorry I missed this question earlier. 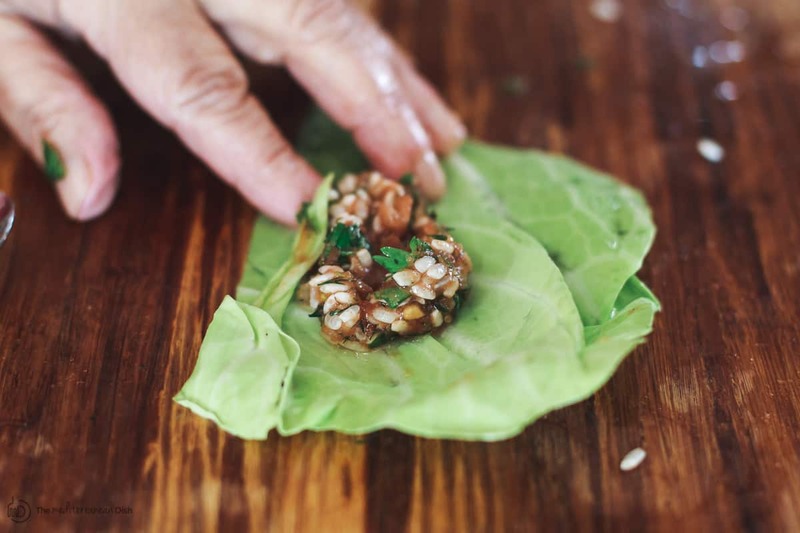 Yes, you tuck in the sides of the cabbage leaves as you roll’em to keep things enclosed. Hope you enjoy these! Holy moly these are amazing!!! 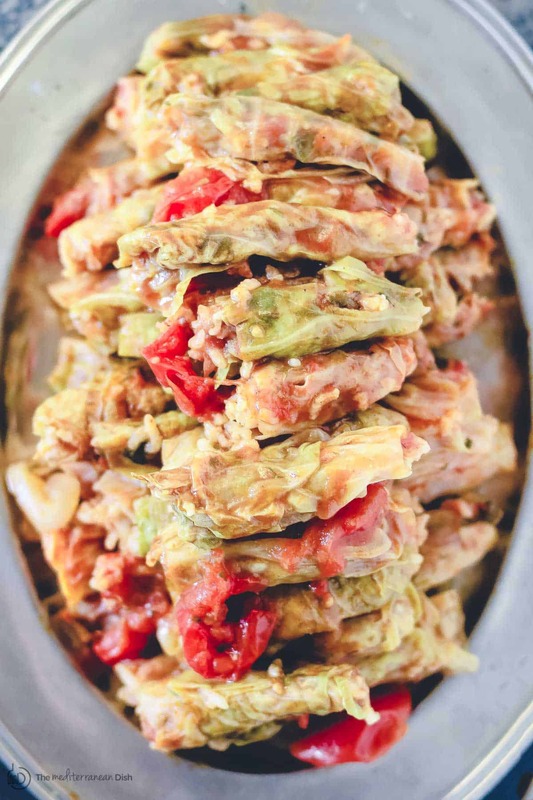 Been craving cabbage rolls so bad lately – glad I found this wonderful recipe! Delicious! Hi Bee! Yay…glad you found us too! 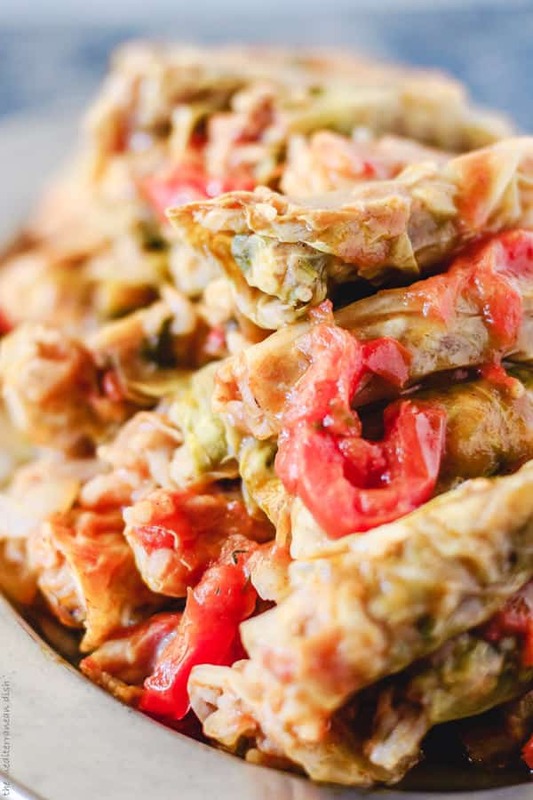 Enjoy these cabbage rolls, and hope you’ll find other recipes here to try. I would be interested to know how you managed to get the stuffing into these tiny thirds of cabbage leaves? Wow thank you, just tried this and it was delicious . I have never attempted to make something like this before . I am currently on a dairy and meat free diet . I have been searching for vegetarian dishes. This was yummy comfort food to the max and healthy at the same time! Awesome! So glad you enjoyed these stuffed cabbage rolls! 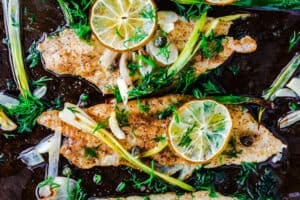 Hope you find more recipes here to try. This recipe turned out so well! 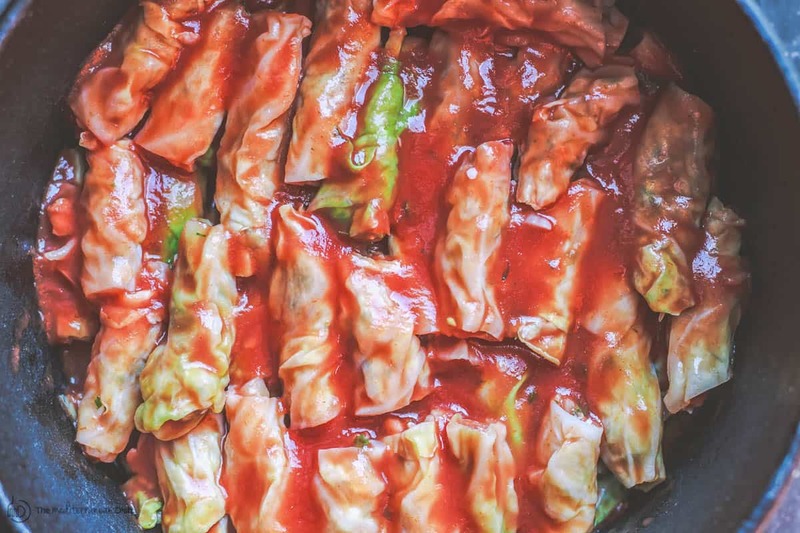 These cabbage rolls are packed with flavor, and they’re surprisingly easy and fun to make. My husband and I are hosting a Father’s Day brunch at our house this year, and these will definitely be on the menu. I bet everyone will think I slaved away for hours. Thanks so much for sharing! Lexi, so good to hear this! I know it looks harder than it actually is, right? Glad you guys enjoyed it.